iSoftBet is known for its collection of movie-themed pokies, but none have the ability to send shivers through your spine quite like Paranormal Activity. This chilling pokies game is based on the Paramount Pictures horror movie, but with bonus features galore you don’t need to be a horror movie enthusiast to get a real kick out of this game. Discover how to play Paranormal Activity at the best online casinos for real money bets. If you’re not familiar with the movie, Paranormal Activity is a truly horrifying account of a couple who believe their house has fallen under the spell of a supernatural presence. Convinced something out of the ordinary is going on, they install a bunch of cameras around their home hoping to capture evidence of the paranormal activity on film, but they get far more than they bargained for when things take a terrifying turn. 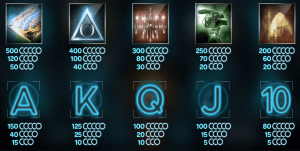 The Paranormal Activity pokies game captures the scary and disturbing elements of the film and brings them to the reels for an online pokies experience that will leave you on the edge of your seat, and not just because of the winning potential. Released in full collaboration with Paramount Pictures, iSoftBet has executed the essence of the movie perfectly, complete with static glitches, disturbing images and a soundtrack that will leave you jumping in suspense. The game is packed with unique bonus features, with the big wins counteracting the fearful vibes – kind of like going through a ghost train knowing there’s a stack of cash waiting for you on the other side. 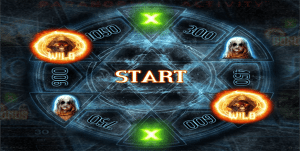 Paranormal Activity is an instant-play game which can be played directly over your Web browser with no downloads required at any of our recommended iSoftBet casinos. It can be sampled for free in practice mode, or you can sign up for an account and make a deposit in order to play for real money bets. Sign up using our links to claim some exclusive welcome bonuses like matched deposits and free spins. It’s a five-reel, 243 Ways video game with 30 fixed paylines and all you need to do is select the size of your wager by clicking the bet button at the bottom of the reels. Here you can choose your coin size of 0.01, 0.02, 0.05, 0.10, 0.20, 0.50 and 1.00. Each spin will cost you 30 times your chosen coin value, with minimum bets starting at $0.30 and maximum bets capped at $30.00. An auto-spin feature also gives you the option of having the computer play anywhere from five to 1,000 spins on your behalf. 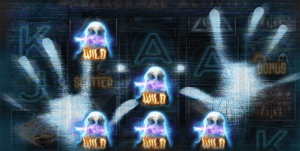 Wild symbol – The games wild symbol is the haunting black-eyed ghost child, which can replace all other symbols to form a winning combination except the scatter and bonus symbols. Scatter symbol – The scatter is the blood covered hand, which pays in any position. 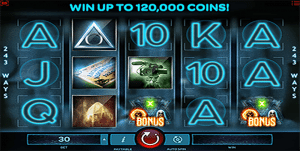 Paranormal Spins = unlimited free spins with increasing multipliers, until five wins are spun. Possessed Spins = 10 free spins featuring extra stacked wilds which possess the reels to increase your winnings. Demon Spins = 15 free spins with demon wild symbols added at random for bigger wins. Instant Wins = Land on a number value to win this amount multiplier by the current coin value in play. Paranormal Event – Just like in the film where you never knew when a scary paranormal moment was about to happen, this game features a Paranormal Event bonus which can randomly happen at the start of any spin. The screen will turn static and some ghostly symbols and hands will appear, awarding up to five extra wild symbols which will be frozen in place for the duration of that spin for some big wins. The collaboration between iSoftBet and Paramount Pictures has resulted in a top-notch slot game that provides one of the only genuinely scary online pokies experiences we’ve seen so far. There’s something about the paranormal that can’t help but put you on edge, and the combination of that fright plus the suspense of hoping to win makes for a truly entertaining online gaming experience. We love the Bonus Wheel and the Paranormal Event bonus, which were triggered quite frequently during our testing, and recommend all players give this one a go. If horror isn’t your thing, turn off the volume to lower the suspense levels and you’ll be good to go.